The Green Siren did it again! Bringing in another, what I feel will be, winning product for all Starbucks fans to enjoy. 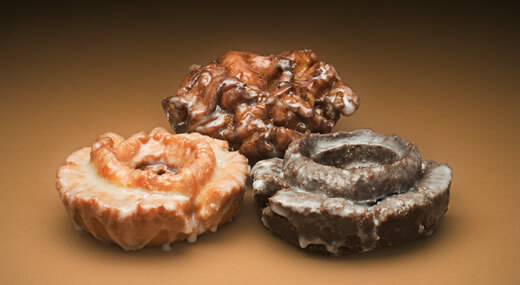 Presenting, America's very own, Top Pot Doughnuts! This delicious, hand-forged doughnuts will be select Starbucks Coffee stores from April 12 onwards. By saying these are hand-forged, these precious yummy snacks were created making very little use of machines. Just like a cup of Starbucks coffee that's hand-crafted to suit your taste. There will be three flavors to choose from: Glazed Old Fashioned Doughnut, Chocolate Old Fashioned Doughnut and my personal favorite, the Top Pot Apple Fritter! Best to serve these warm, you'll enjoy the melt-in-your-mouth cinnamon-sweet taste in every bite! I also love it that the sugar glaze leaves a favorable crunch on the outside too. The good news is that all Top Pot doughnuts have zero grams of Trans Fat! Yahoo! Watch out for these coming in your favorite Starbucks Coffee stores SOON! Hi Franny! How does the taste differ from KK?